Walk into Tony’s Pizza Napoletana in the heart of San Francisco’s Little Italy in North Beach on most days, and without fail, you’ll encounter a bustling, boisterous vibe – and a wait for a table. See what the hype is all about as you sample both Italian and American pizza making traditions and watch the hoarded of locals, tourists, and business meetings alike. Tony’s is one of those establishments that successfully caters to everyone. Who doesn’t like pizza? With so many styles from across the boot of Italy and coast-to-coast America, the menu can seem overwhelming with possibility. Love Neapolitan pizza? 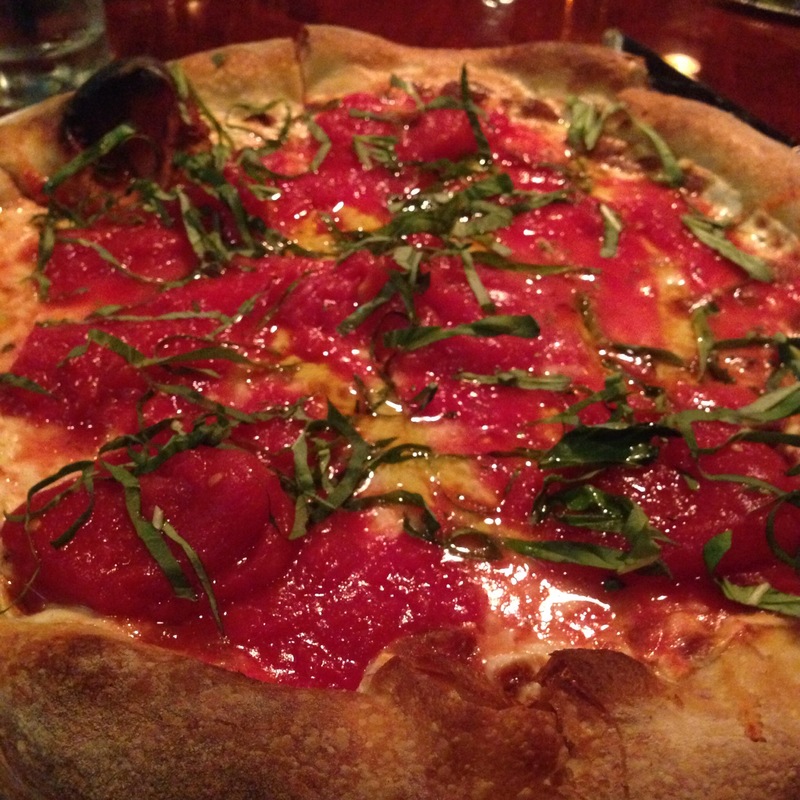 Try their prize-winning Margherita (limited availability), fired in a 900 degree (Fahrenheit) wood-burning oven. Or go Roman – long and thin from a 700 degree gas oven. Of course, who could forget their Sicilian pizzas, which also have garnered international recognition. Perhaps you’re feeling a bit more nostalgic for Americana. Maybe massive New York – or Trenton – style pies are your taste. Or head to the Midwest, where you can try a Detroit style pie in a Detroit steel pan, or a super-thin St. Louis style pizza. If those don’t hit the spot, go California-style with the state’s trademark alternative spin on tradition, with a crust made from a range of flours (including whole wheat and spelt), fired to 900 degrees in a wood-burning oven, and with toppings one might not expect. The Hang Ten, for example, pairs Korean BBQ short ribs, pickled vegetables, and mozzarella. So what did I choose? Both times, or selections were from the Classic Italian lists. I couldn’t resist the combination of basil and Rosemary, so on my first trip, I chose the Di Napoli (pictured above). Slightly more complex than a traditional Margherita, the savory rosemary and basil were perfect for a cool, damp evening. On the second visit, my local friend – a regular well-known to the staff – was convinced to revisit her favorite pizza, the Diavola (substituting prosciutto for the sopressata). 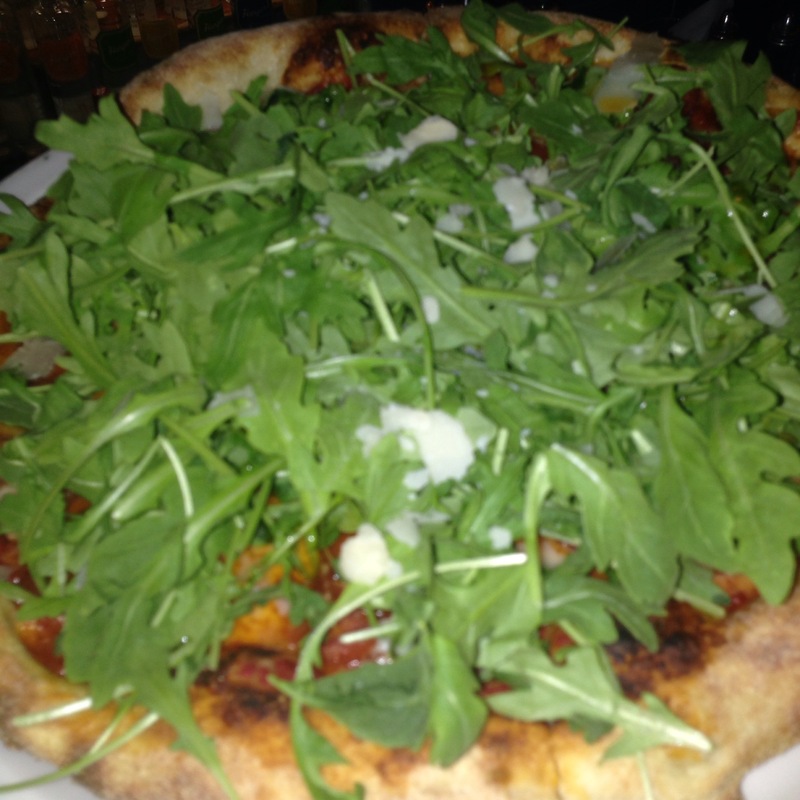 This pizza is a wonderful juxtaposition of salty meat and cheese with slightly peppery, fresh arugula all on a thin, not quite Neapolitan crust. Lest you not feel like pizza, or you’d like a vegetable main or side dish, don’t skip their other offerings. 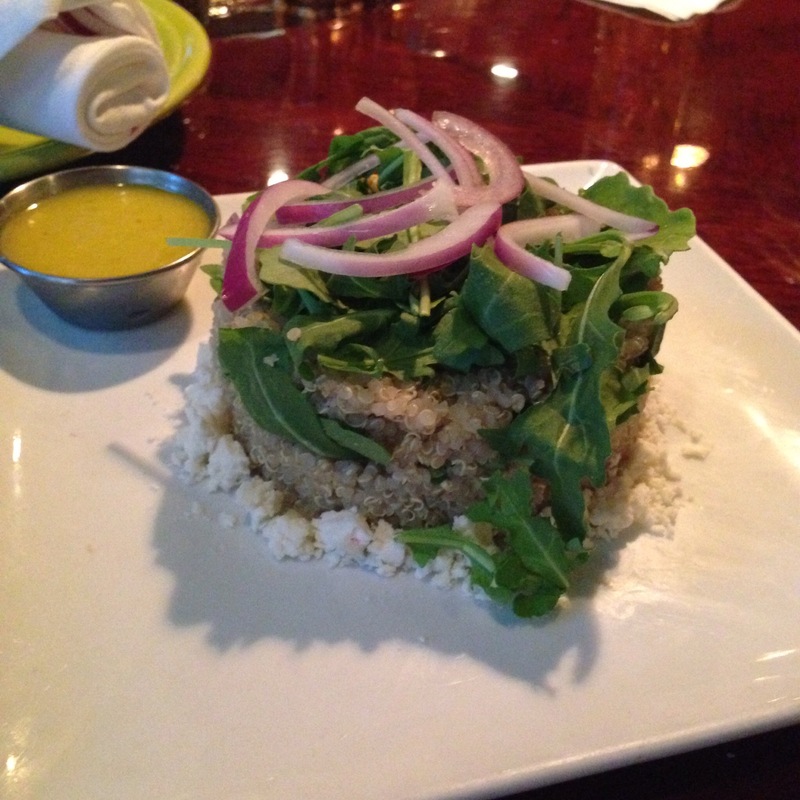 The quinoa salad is a light, satisfying meal or side dish, with a citrus vinaigrette bringing together arugula, quinoa, red onion, and feta. The best insider secret is to customize their insanely mouth-watering deep fried green beans by asking for them to be topped with burrata and shishito peppers (that addition does not appear on the menu, and it went far too quickly to photograph). I never would have thought to pair creamy burrata with garlicky green beans, but the combination is a wonderous taste and texture explosion. How is this not a thing?! It almost made me forget about pizza entirely, had it not been for a few glasses of rosé wine. Whether it’s your first or 18rh visit to Tony’s the experience will never grow old. Your options would take a lifetime to cover!